Progress M-21M undocking from the ISS during the 2nd Kurs system test, April 23, 2014. Progress M-21M (Russian: Прогресс М-21М), identified by NASA as Progress 53 or 53P, is a Progress spacecraft used by Roskosmos to resupply the International Space Station (ISS) during 2013. Progress M-21M was built by RKK Energia. The spacecraft was launched on time at 20:53:06 UTC on 25 November 2013 from the Baikonur Cosmodrome in Kazakhstan. The Kurs-NA docking system was tested by Progress M-21M during a fly-by of the ISS on 28 November 2013. Progress M-21M later docked with the ISS on 29 November 2013 at 22:30:20 UTC. Progress M-21M delivers to the ISS about two and a half tons of cargo, including fuel components, water, service equipment, equipment for scientific experiments, containers with food and parcels for the crew. The total mass of all delivered goods is 2398 pounds. On 13 March 2014, M-21M was used to raise the orbit of the ISS by "two kilometers" after an engine burn of "almost ten minutes". 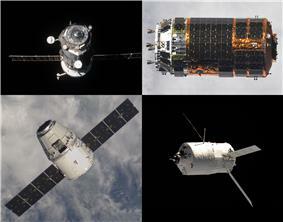 Progress M-21M undocked from the ISS on June 9, 2014 at 13:29 UTC and was de-orbited the same day at 17:23 UTC.